« Happy Easter and thank you Jesus! 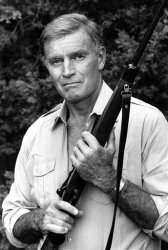 One of my favorite actors of all time, Charlton Heston, passed away this past weekend at the age of 84. I thoroughly enjoyed his movies such as The Ten Commandments, Ben Hur, Soylent Green, Planet of the Apes and plan to try to find some of these to watch this next weekend in his memory. I also was a fan of his NRA support and steadfast support of the conservative movement. He was a man’s man and was the kind of strong figure we as men in America should look up to and try to emulate in many ways. Speaking in general terms, I think men in America are “soft” compared to those tough men who fought in the World Wars and stood up for what was right. The next time someone tries to slam you for being a man, think of Charlton Heston and toughen up a bit. I look forward to finding Mr. Heston in heaven and talking to him more about his various roles in his life, while thanking him for the wonderful memories. This entry was posted on April 7, 2008, 10:57 and is filed under Personal. You can follow any responses to this entry through RSS 2.0. You can leave a response, or trackback from your own site. I think I will watch a few movies too this weekend!